Why I use collage... Texture, tonal value, structure, humour, contrast, cohesion. These are some of the reasons I love using papers when creating a mixed media painting. This is a very different style of painting and working compared with watercolours or acrylics. In art groups I attend, as the other members look at each others' work it is most often mine that they cannot understand. Building up differnt layers means it is hard to understand or 'read' the painting until it's nearly finished. Sometimes it's only with the last stages that the painting comes to life. When I work I do no initial drawing. The papers are applied first. I stick all my collage materials on with diluted PVA glue - single cream consistency. I tend to work on 300 lb Saunders Waterford water colour paper rough. This is a fantastic support. It is already textured and because of it's weight will stand a lot of moisture and paint being used. It is my favourite surface to work on. I do also work on deep box canvases. I always prime them first with gesso. Follow links to the materials page for further information on supports. Collage can also be used for texture - tissue paper or angel wire work well for foliage. Handmade papers are effective for fields and hills. Corrugated paper is great for rooftops. 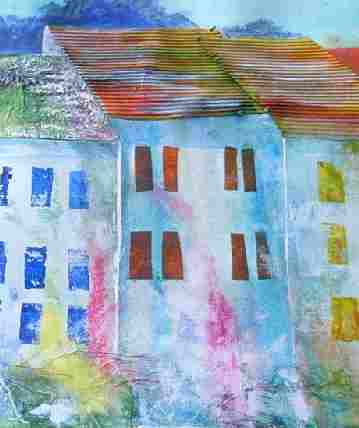 In this painting,collage in the form of tissue paper is used in the foreground, corrugated paper on some of the roofs and magazine pages to suggest windows. Some paper is torn, other is cut, adding to the contrast and interest. Dark coloured tissue paper can be used to define the darker, more intense shadows in your painting. Sometimes this is where I start. Sticking on the tissue to define my darks, and to suggest areas of color, I add in colored tissue paper. (Follow my step by step guides to see how this kind of painting develops). Structure can be created with collage, be it tree trunks, buildings, or break-waters. Using some cut shapes adds to the structure and definition in your painting. Look at the beachscape on the mixed media landscape painting page. Contrast in a painting helps keep it alive. Many artists use complememntary colours to achieve this. In mixed media this contrast can also be achieved by usiing different materials. Below is a simple painting of a blue bell wood. 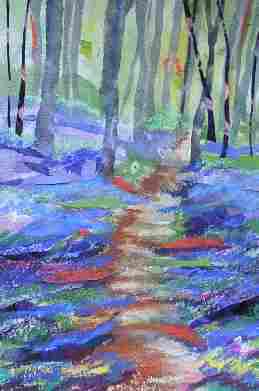 The gentle carpet of blue bells was created with soft hand made papers, torn and worked over with paint and pastels. In contrast the strong tree trunks were achieved by using cut parts of magazine pages. Cohesion over a whole painting can be achieved by scrumpling a large sheet of white tissue paper and once smoothed out sticking it over the whole of the surface you wish to work on. I have found this successful when painting fields and hedgerows. Why not add pictures to your painting? Newspaper is always fascinating. Sometimes I choose words or phrases that link to my subject matter. This can add interest and even humour to your work. Want to discover more? Yes? Then follow my step by step mixed media painting projects.